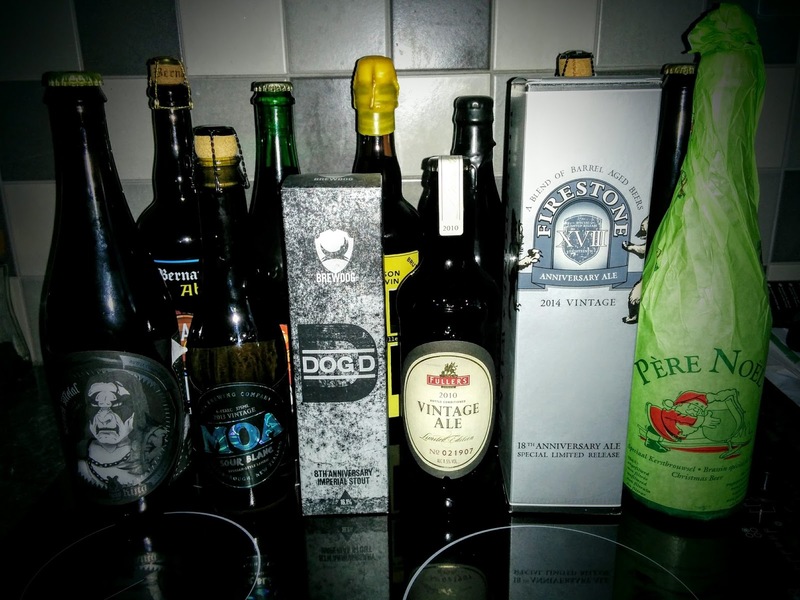 As the festive season pulls sharply into focus, thoughts turn once again to Beer O'Clock show's twelve beers of Christmas. This simple idea is all about drinking some decent beer over the Christmas period and using whichever is your preferred social media channel to talk about it, should you wish to. For me, it's as good a reason as any open a few things that have been acquired throughout the year rather than wait for a really special occasion - not that Christmas isn't special of course! In previous incarnations, I've made the mistake of biting off more than I could chew by picking which beers will be drunk on which days in advance, only to find that I either didn't fancy that day's beer or it was a big boozy bottle with nobody around to share it with. This year, I'm going to go with the flow. I've got some lower ABV beers there to ease in with. Some will be shared and others will be sipped and supped selfishly while pondering Christmas' great question - what else can I eat without leaving this chair? I might even have more than one on a given day then have a (gasp!) day off. St. Bernadus Abt 12 (Oak Aged): This was a gift from my good friend Phil Hardy, who came down to visit en-route to a family wedding a few months ago. Phil's had a tough year but one that closes out with him having fulfilled his dream of opening his own beer shop, Otter's Tears. All up, 2015 has been a good year for seeing friends either make the leap into working in beer/brewing full time or make excellent progress towards the same. We'll be raising a glass to Phil and his lovely wife Rachel when this one's cracked open. Congratulations, guys! Fantôme Boo (2012): Dany Prignon's beers are known for being a little bit left of centre. You never quite know what you're going to get. This is a Saison brewed with pumpkin spice, the back story of which is covered here. Indeed, that forum post was right in that I was able to this up at Beer Boutique in Putney, I think at the back end of 2012 but it may have been 2013. The cork looks somewhat 'stressed' so I'll be opening this one outside! Mikkeller Nelson Sauvin (Reisling BA): This one got a shout out in my Golden Pints as the best overseas bottled beer. BrewDog were selling these online for about £20 if I recall. The EFP discount softened the blow but, no matter, the moment I opened one of these earlier this year, I went online and bought a few more in a decadent splurge that I only slightly regretted the next day. Is it beer? I don't care. It's a sublime creation, the aroma of which leaps out of the glass to fill the nostrils with gooseberry and melon. The wine barrel adds a depth of complexity - just enough to make this one to contemplate rather than gulp down, which is entirely possible despite its 9% ABV. I'm looking forward to this immensely! Magic Rock, Bourbon Barrel Bearded Lady (No. 2): Sadly my last bottle of this release (which is a couple of years old now) but all good things must come to an end. This year marked the end of the Huddersfield-based brewery's first home, as they moved to a much larger site closer to the centre of town. Magic Rock have experienced phenomenal growth and richly deserved success since their opening in 2011 - a sentiment I tried to capture both here when I first sampled this release and here when we went up to the launch of their new tap room earlier this year. A transitional year leaves them in a position to grow even more in 2016 and that's certainly worth celebrating. Cheers Rich, Stu, Scott, Joe, Nick, Becky, Dunc+Team and anyone else I've missed - hope you enjoy your well earned Christmas break! The Lost Abbey Gift of the Magi (2014): This was a year in which I went back in time to rediscover some of the Belgian classics I'd enjoyed when first expanding my beery horizons in the late 90s. This beer was one of the first really good modern takes on the golden strong ale style, in my view. It's a beer I've had a few times but one I love to revisit - definitely in the decadent sipper category! Wild Beer Co Put it in Your Pipe: Wild may be better known for their sour, farm house and hoppy beers but they certainly brew some very impressive dark beers too. I picked this one up on release but since then it has, rather shamefully, lurked at the back of the beer shelf gathering dust. I'm sure it'll be no worse for it, however. At 5.5% this is one of the lower ABV beers in this selection but from the description, it sounds like it won't be lacking in flavour. Will 2016 be the year the new-wave of British breweries fall back on beers such as this in order to preserve precious hop stocks? Jester King Black Metal: I first encountered the wild yeast fermented creations of this Texas-based brewery at De Molen's Borefts festival back in 2012. I recall vividly being wowed by a sour stout - perhaps even the first one I'd tried in that style. The programme suggests that was probably Funk Metal rather than this, which I'm guessing may be its bigger sibling given the higher ABV. I'm not sure where I'll fit this one in - you need to be in the mood to tackle 750ml of 10% anything. Perhaps I'll do well to share this one! Moa Sour Blanc (2013): This was picked up from South London's excellent Hop, Burns and Black - Moa being one of several New Zealand breweries they stock. I had the good fortune to visit Moa during our amazing pre-wedding adventure in 2012 and it was one of the few things I actually blogged about on that trip. This beer is brewed in the traditional Belgian Lambic style and fermented with wild yeast in oak barrels. My palate may well need to call upon this one at some point. BrewDog Dog D: The 4th release of the Abstrakt series was much celebrated and we were such huge fans of that beer, to the point we actually crowned our wedding breakfast with a snifter or two. It was a chilli infused stout with such incredible depth. BrewDog eventually saw sense and re-brewed it, opting to use the recipe as a base for an anniversary release (Dog A). This is the fourth incarnation of that (fifth if you count AB:04 itself) but the first to be barrel aged. I've yet to sample it so this bottle will be much enjoyed, I'm sure. I might even share it with my lovely wife. Might. Fuller's Vintage Ale (2010): The last of six bottles I purchased from Waitrose in Wokingham five years ago, on the say-so of Mark Dredge. I recall Mark tweeting about it and first bringing this beer to my attention as until then, I wasn't even aware it existed as an annual release. At the time I was looking for some beers to stash away to see how they changed over time, and this proved to be the perfect one to start the collection with. I drunk the first fresh and have sampled a bottle each year since, so this is another good thing coming to an end. If there's anyone out there thinking of starting a beer 'cellar', you'd do well to grab a few bottles of this year's! Firestone Walker 18th Anniversary Ale: These annual releases are, without fail, exceptional beers. I recall taking the very first one I got my hands on (14th) up to Rick Furzer's Open It Live event in Leeds - I think that was in 2011. It was good enough to silence a whole table of fellow beer geeks (we had a lot of great beer that night, to be fair!) so I've sought it out each year since and have yet to be disappointed. This is last year's release and one I've had previously, so I know I'm in for an absolute treat. De Ranke Père Noël: This is a Christmas favourite that will probably see light of day on the 25th itself. 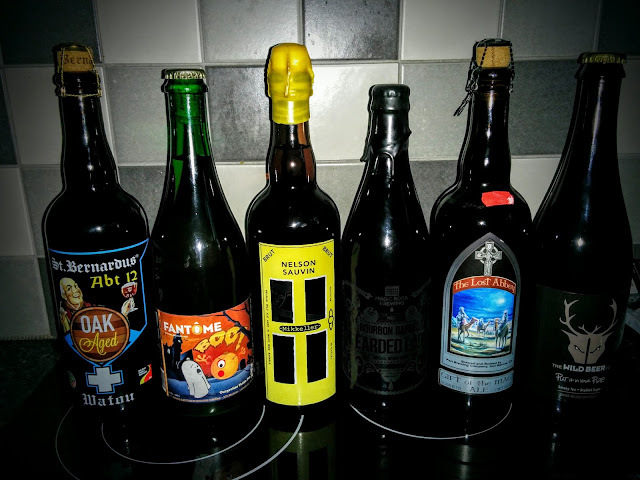 Belgium loves a good Christmas beer. Breweries there seem to mostly find the right balance between too little and too much spice, usually relying on one of their well-honed base beers, building the flavours atop until it just seems to work. I'm also a huge fan of St Bernadus' festive release so that may well get an airing too - after all, t'is the season to be jolly!